Versatile compression with extra top end if you need it. Glassy top end boost option. Wide range of compression. 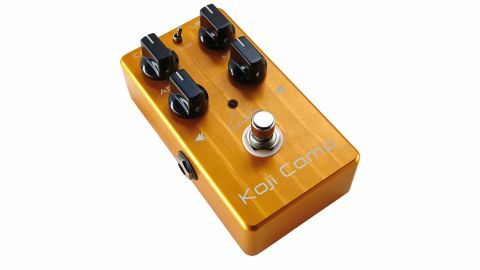 Besides the standard compression and level knobs you'd expect on any compressor, the Koji Comp also offers a mix knob, which lets you mix some direct sound in with the effected one for parallel compression blends. "There's a wide range of compression: from a smooth evening of dynamics to the thick squash of a vintage Dyna Comp"
It also has enough output gain to boost your amp into overdrive, which combines well with a voice switch that can deliver extra top end. There are two distinct EQ boosts: one in the upper-mids only, the other offering upper-mid boost combined with a glassy top end. This counteracts compression-created dullness and also adds a sweet chime that's particularly effective on clean notes and chords. There's a wide range of compression here, from a smooth evening of dynamics to the thick squash of a vintage Dyna Comp, with plenty of scope to dial in a percussive edge to your note via the attack knob. With a neat blend of facilities, not least the mix knob's subtleties, this should take care of all your compression needs.